From Belle Isle interchange to the A1, a number of unique and interesting structures were required - from the enormous Aire Valley Viaduct to the impressive and unusual arch bridge at Newsam Green. Some are less visible, having been placed underground. 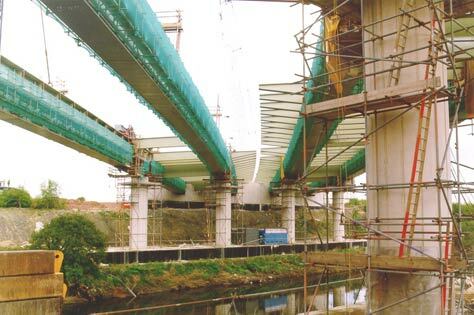 The largest structure on the scheme is the Aire Valley Viaduct, at 250 metres long. It carries the M1 over the River Aire and the Aire and Calder Navigation canal. 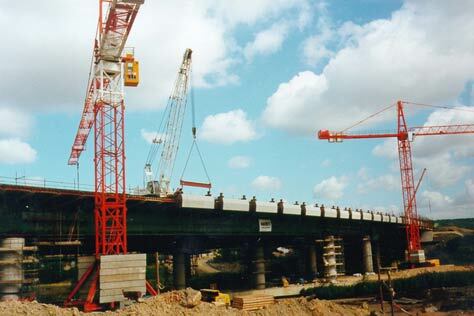 The viaduct is a five span steel beam structure with a composite concrete deck. The structure contains approximately 4000 tonnes of structural steelwork, and with beams 3.5m in depth weighing up to 150 tonnes. 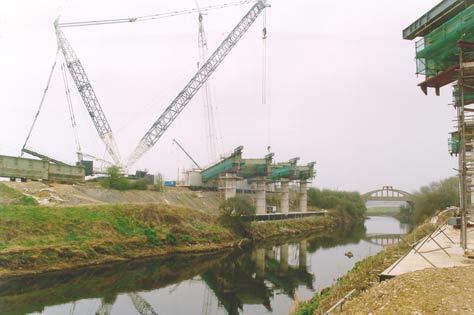 Some of the largest mobile cranes in the country were used to lift them into place across the waterways: the largest was capable of lifting up to 1200 tonnes. One set of beams in place from the abutments to the south piers. 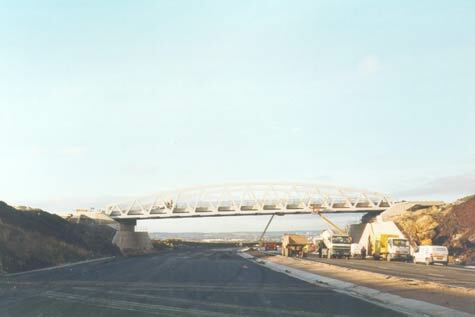 The main span beams in place, as seen from below. 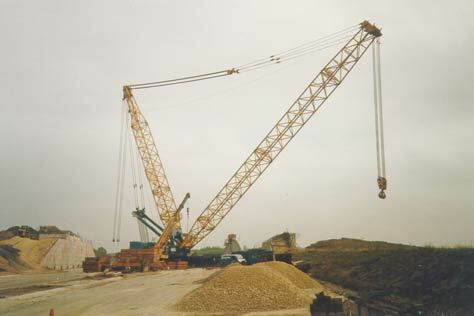 The Leibherr 1200t crane supplied by Baldwins for lifting the beams. This structure carries an accommodation track and bridleway over the M1 between junctions 45 and 46. It comprises two steel trusses with steel cross girders and an in-situ concrete deck supported on mechanical bearings on reinforced earth abutments. The structure is unusual considering the type of road it is carrying due to the ground conditions in the area. Prior to construction of the M1, the land in the vicinity was used for opencast coal mining and afterwards was filled in. As such, large settlements have been experienced in this area, and the structure had to be designed to accommodate differential settlement of up to 1m. The structure was erected at ground level to reduce the cost of temporary works during erection. It was erected onto its bearing using an 800 tonne crane on 07 September 1998. The Gottwald 800t crane used to lift the structure from the ground into its final position. 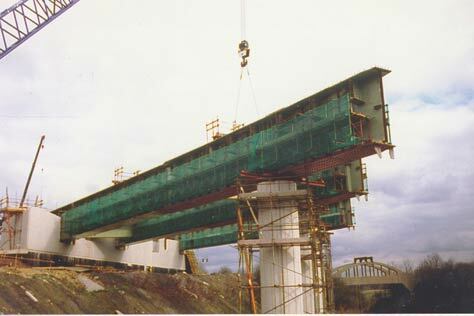 Newsam Green Bridge, the completed structure. Photograph taken 4 December 1998. Drainage of the carriageway was split into a number of sections with outfalls into existing watercourses. 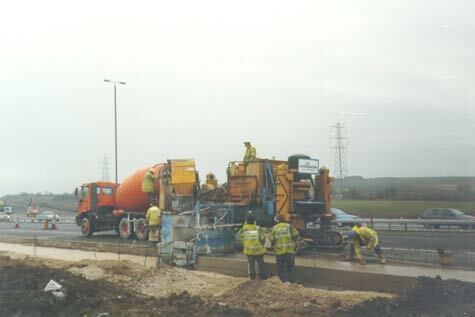 A majority of the carriageway was drained using a 1.5m concrete V channel cast next to the carriageway edge with chambers at approximately 100m centres. The channel was cast using a concrete slipform paver with a special mould. All drainage runs flowed into petrol/oil interceptors to skim off oil mixed with surface water running off the carriageway, before being discharged into a watercourse. To prevent flooding to the local rivers and streams, balancing ponds were constructed to store runoff arising from large storms and the discharge rate was controlled. At the end of one drainage run, the water was discharged into The River Aire. Here the pipework had to pass underneath the Leeds/Sheffield railway line and the Aire and Calder Navigation. To achieve this with minimal disruption to the railway and the canal, two pipejacks were carried out, one under each obstacle. 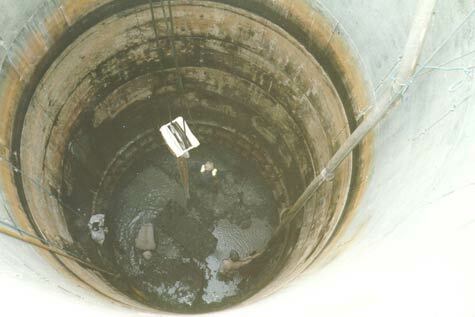 For these, shafts were excavated each side of the obstacle and concrete pipes were jacked from one shaft to the other. At the head of the excavation, a miner would break out the rock and use sleds to transport it back to the shaft. 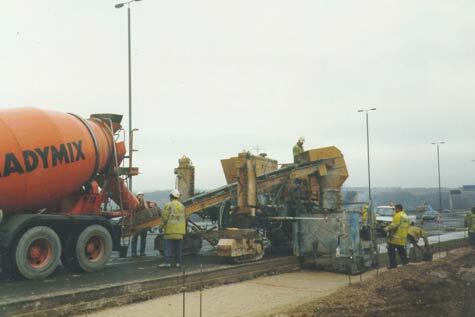 Slipform paving machine used to cast the 1.5m V shaped concrete channel. Photograph taken on 3 December 1998. Another view of the above in action. Shaft constructed as part of the inverted siphon under the Aire and Calder Navigation. Photograph taken 17 September 1998. Pipejack operation under the Leeds to Sheffield Railway Line. 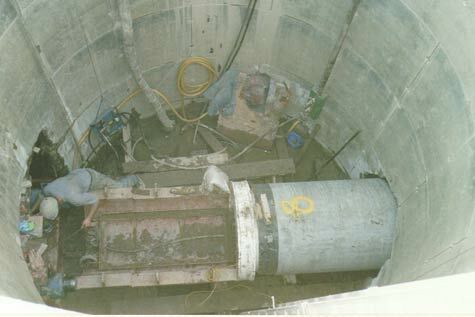 The photograph shows the concrete pipe segments used and the hydraulic jacks. Photograph taken 25 September 1998.